Is Italy a symbol of food and wine? No one will argue with the fact that Italian food is the favorite cuisine of most people. Italian cuisine is a perfect combination of exquisite aromas, herbs and spices, delicious cheeses and, of course, noble and high-class wines. Let’s not forget their intense and velvety Espresso or their rich and flavoured Gelato. Italian culture is strongly steeped in the arts, family, architecture, and food. For them there is nothing more sacred than sitting with the whole family at the table and enjoying homemade food. If you’re lucky enough to have ever eaten in an Italian family home, you’ll be well aware of how generous Italian people are, particularly when it comes to food. Italian food has simplicity at its heart. Italians make their food from fresh ingredients from the ground and cooked simply with AMORE. Italian food has authenticity. Italians preserve their food heritage wholeheartedly and it is felt at the center of their culture with the deepest pride. However, Italian food is extremely regional. Italy is known as the nation where every region, village, and town developed its own specialities and cooking methods for sauces, pastas, wines, cheeses and desserts. And no! Spaghetti with meatballs and Caesar’s Salad are not Italian dishes! Italians can be fiercely conventional when it comes to food. And the endless discussions about how a dish is made to what sauce goes with which type of pasta are serious business. Yes, it does matter… In Italy you cannot match the wrong pasta shape with the wrong sauce! For example the Rigatoni goes well with rich tomato sauce as the sauce will more likely stick to its stripes while the spaghetti will better suit a light cream sauce that will coat the strands evenly so they won’t get weighed down when wound up with a fork. But all these amazing Italian dishes do not have the same taste if they are not paired with a great bottle of wine. Wine is considered a symbol of the Italian Art of Living and is present at the table at every meal. 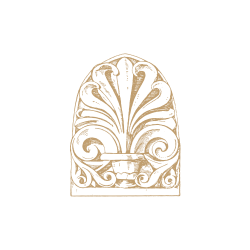 Italy is known to have a long tradition in producing a great variety of wines from a number of geographically different regions. Some argue that the word vino (wine) originates from the Sanskrit word “venas” which means “to love”. And that the name “Venus”, the Roman Goddess of Love, comes from the same origine. Desire-Love-pleasure… No wonder then that this word identifies a drink so full of sensuality. Now, if you think that Italy is only famous for Pasta, Pizza and Wine, well think again. Sweets have been part of the Italian culinary tradition as long as the times of the Ancient Romans who used to cover fruit, flowers, nuts in honey to make sweet treats. Italians have delicious “regional “ desserts. The famous “Cannoli” are from Sicily, “Panettone” is from Milan and from Napoli comes the” babà”. And what about their legendary mouth-watering Gelato that is such an anchored heritage in the Italian way of life? Did you know that one of the first traditions of the Wedding Cake began in Ancient Rome? 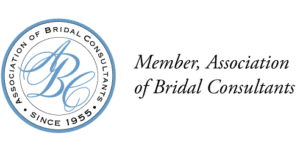 In these times, wedding cakes were not eaten -nor they were sweetened- but instead they were broken over the bride’s head to bring good fortune to the couple. 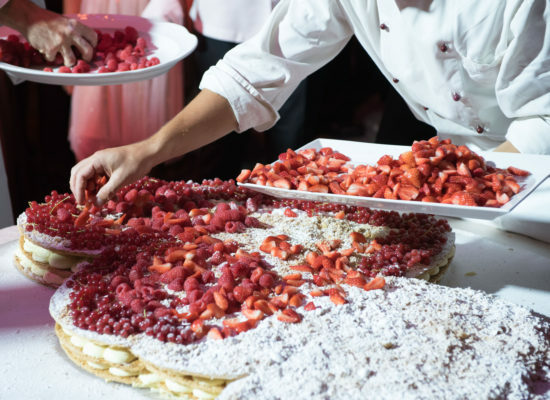 Nowadays, the traditional Italian Wedding Cake is the “Millefoglie”, literally a “thousand layers”, which is a flat cake made of many layers of light filo pastry and cream, topped with strawberries or mixed berries and dusted with powdered sugar. The millefoglie is usually prepared in front of guests as a form of show cooking that will delight everyone! 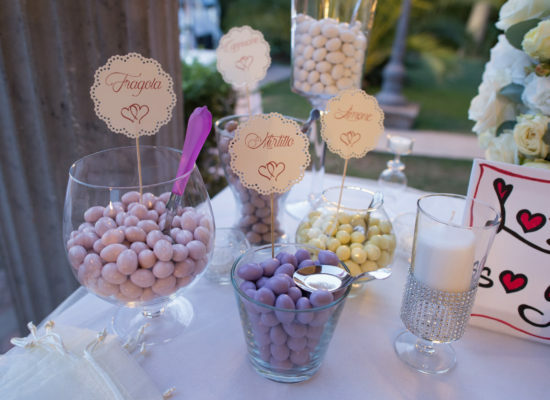 With the “Confettata”- the Italian version of a “candy bar”-continues the charm of an-all Italian wedding. In Italy, “Confetti” are sugared almonds and not the ones that you throw in the air at parties- those are called “coriandoli”. A scenografic table is set, visible to the guests only after the cutting of the wedding cake, with a particular care for every detail. Different flavors of “confetti”- fruit fillings, coffee, chocolate and flavors like tiramisu, limoncello,amaretto or ricotta- are displayed inside glass jars and vases of different types. These containers are spread out in a spectacular way among candles, flowers and other decor rigorously in tune with the theme of the wedding. Little cone paper, lace or silk bags are available to the guests to fill with their favourite flavor to take home. 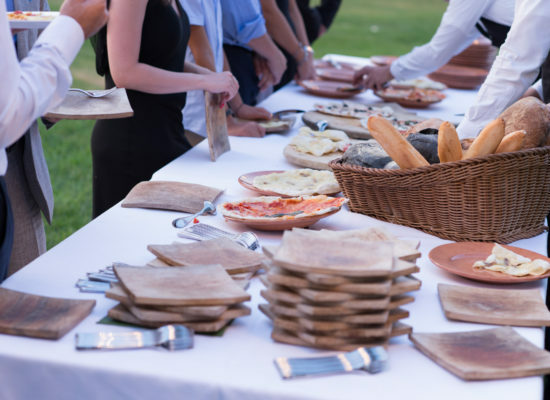 Food and wine are so embeded in the Italian culture that they naturally have a central emphasis at a Wedding “Fiesta”. 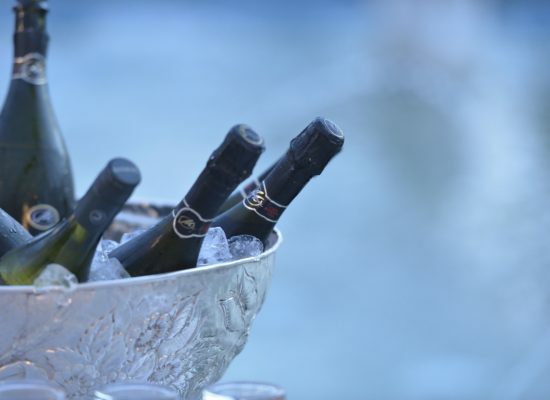 Wedding receptions in Italy tend to be quite lavish starting with the traditional “Aperitivo”- which is similar to cocktail hour but with a much more deal of food- rigorously paired with “Prosecco” and a rich selection of red and white wines. Then comes the “Primo”- two or more pasta dishes- followed by the “Secondo” which is the main dish. Often, as many as fourteen different courses can be served!  Having explored all of the above, Just Amore is ready to tempt you with a vast repertoire of ideas and wonderful venues for getting married in Italy. So, put some extra thought into where you say “I do” and let Just Amore take over. 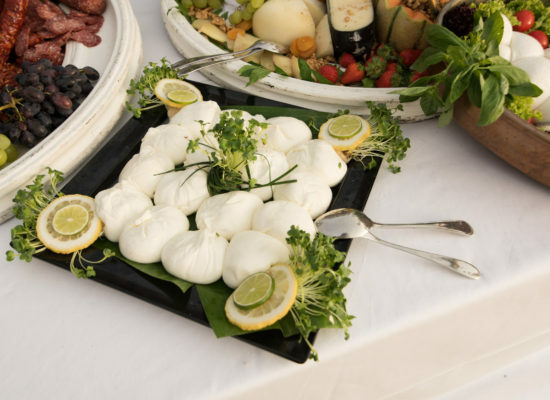 We would love to welcome you to Italy and “Buon appetito”!